Mugwort Herb - Estafiate by El Guapo blooms from July to October. The Mugwort flowers are small and yellow with a hint of green. Mugwort a plant of the sunflower family and is a tall shrublike perennial plant. Can grow up to 5 ft tall, and has purple angular stems. Mugwort has many common names like 'felon herb', 'St. Johns plant' and 'wild wormwood'. Mugwort is a perennial herb native to Europe, Asia, and northern Africa. mugwort is used for moxibustion, for a wide variety of health issues. Moxibustion is a method of heating specific acupuncture points on the body to treat physical conditions. In all instances, the herb is ignited and releases heat. Not only is it the herb which is believed to have healing properties in this manner, but it is also the heat released from the herb in a precise area that heals. Mugwort is carefully harvested, dried and aged, and then shaped into a cigar-like roll. This "moxa" is burned close to the skin to heat the specific pressure points. Mugwort has stimulant and slightly tonic properties, and is of value as a nervine and emmenagogue, having also diuretic and diaphoretic action. Mugwort leaf and stem have been used medicinally to promote menstruation and as a digestive stimulant. The nervine action of mugwort is thought to aid in easing tension and depression, which appears to be due to the volatile oil, so it is essential that this is not lost in preparation. 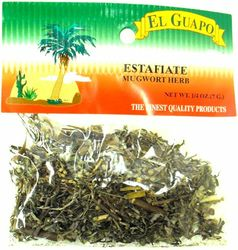 Other things that Mugworth is said to heal are: Anxiety, stress, insomnia, Asthma, Bacterial and fungal infections, Diarrhea, cramps, intestinal gas, Epilepsy, Fever, Headache, Irritability, restlessness, Menopause symptoms, Menstrual complaints, Mild depression, Muscle spasms, Persistent vomiting, Skin inflammation. Tapeworms and other worms. It should not be used by pregnant or nursing women. Large doses and regular use over a prolonged period of time should be avoided, as it could cause liver damage. Make sure to contact your physician before taking this product. Mugwort Herb - Estafiate de El Guapo florece desde Julio hasta Octubre. Las flores del Estafiate son pequenas y amarillas con un tinte de verde. La planta del Estafiate - Mugwort pertenece a la familia de los girasoles y es un arbusto perenial. Puede crecer hasta medir 5 pies, y tiene tallos morados angulares. El Estafiate - Mugwort tiene varios nombres comunes y tambien es conocida como "Hierba Criminal," "La planta de San Juan," y "Ajenjo Salvaje." Mugwort o Estafiate es una hierba o planta perenne nativa de Europa, Asia y Africa del Norte. Mugwort o Estafiate es utilizada para la moxibustion, en una amplia variedad de problemas de salud. Moxibustion es un metodo usado para calentar puntos especificos de acupuntura en el cuerpo para tratar condiciones fisicas. En todos los casos, la hierba es encendida para que suelte calor. No solo se cree que la hierba tiene propiedades curativas de esta forma, si no que debido al calor emitido de la hierba en el area precisa que cura. Mugwort o Estafiate es cuidadosamente cosechada, secada y anejada, y luego formada en un rollo tipo cigarro. Esta "Moxa" es quemada cerca de la piel para calentar los puntos de presion especificos. Mugwort o Estafiate tiene propiedades estimulantes y ligeramente tonicas, y sirve tanto como tonico nervioso y emenagogo, asi como el tener accion durietica y diaforetica. El tallo y la hoja de Mogwort o Estafiate han sido usados medicinalmente para promover la menstruacion y como estimulante digestivo. Se cree que la accion nervina de el Estafiate o Mugwort ayuda en a aliviar la tension y la depresion, debido a su aceite volatil, asi que es esencial que no se pierda en su preparacion. Se dice que tambien sirve para estimular el sueno, para tener suenos mas lucidos, tener control y recordarlos claramente, asi como tambien tener proyeccion astral. Si se toma antes de dormir se tienen suenos lucidos, se tiene control y se recuerdan con lujo de detalle. Otras propiedades que se le atribuyen al Estafiate es que cura: La ansiedad, estres, insomnio, Asma, Infecciones bacterianas y micoticas, la diarrea, los calambres, gas intestinal epilepsia, fiebre, dolor de cabeza, irritabilidad, inquietud, sintomas de la menopausia, quejas menstruales, depresion leve, espasmos musculares, vomito persistente, inflamacion de la piel, solitarias y otras lombrices. No debe ser utilizado por mujeres embarazadas, especialmente en el primer trimestre pues puede causar aborto, ni por mujeres que esten amamantando. Evite el uso prolongado o regular y en grandes cantidades de este producto ya que puede causar problemas en el higado. Es importante que antes de usar este producto, consulte a su medico. My family has used this herb for years but I never really paid much attention to its benefits. My 98 year old mother lives with me now and I found this herb to be the only thing that relieves her stomach ailments and diarrhea. Since then I have also tried the herb in hot tea. It has a very strong taste and by mixing it in tea with some sort of sweetener really helps. This Mugroot Herb really works after one cup of tea.